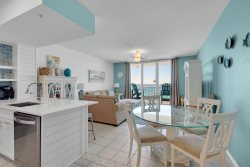 "Beach Burrow II" is a large 3 bedroom 3 bath Gulf front condo that sleeps 8 on the 8th floor. You will feel right at home from the moment you arrive in this comfortable nicely furnished condo. Summerwind 801C has many amenities that guests will enjoy such as a TV in every bedroom, a large flat screen TV in the living room, WiFi, a fully equipped kitchen, beach decor, plenty of dining space, a full size washer and dryer, a large wraparound balcony and amazing views of Navarre Beach and the Navarre Sound. The is condo offers a king bed in the master, a king bed in the guest bedroom, 2 Twins in the 2nd guest bedroom and a queen sleeper sofa in the living room. Also enjoy the convenience of covered parking when renting Summerwind 801C. Your team has always been helpful and answered any questions we had. We have always enjoyed our visits to Navarre. This year we chose to leave early because of the storm. We would love to come back to Navarre, and stay at Summerwind whether in 801C or one of the other condos. It was very restful and we enjoyed our time so much it was hard to leave. They were very friendly and always smiling! Loved it!! We will be back for Labor Day!